Please consider wearing gloves if you have sensitive skin, and try not to rub your eyes as you put this tonic together, as some of the natural oils involved can lead to unhappy muttering. 1. Start with a 350 mL to 500 mL mason jar. Add roughly chopped onion. 2. Roughly chopped garlic next please. 3. Followed by red chili peppers, seeds and all. 4. Then chopped ginger - what a lovely hue of yellow in fresh ginger. 5. Add fresh lemon juice - what you can get out of one medium-size lemon. It's fine to substitute with lime if you wish. 6. 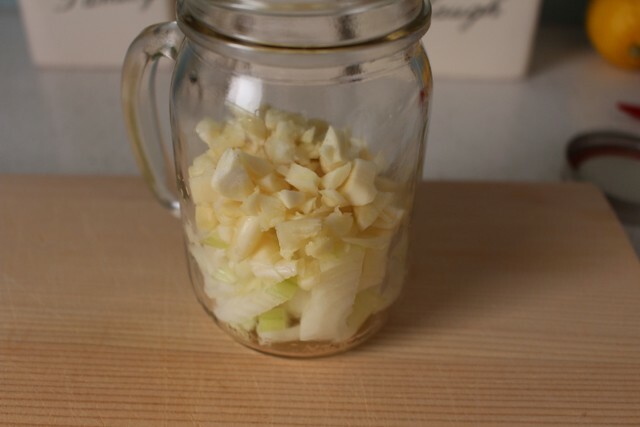 Top off mason jar with apple cider vinegar, but leave about a cm of room at the top. 7. 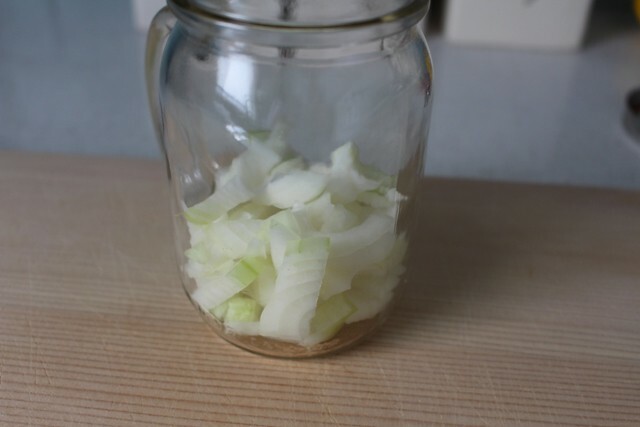 Cap your jar and leave on your counter or in a pantry for a day or two before refrigerating. Your sore throat, cold, and flu tonic is ready for use! Take one teaspoon as often as you'd like. As a prophylactic tonic, one teaspoon each time you return from spending time around others is a good schedule. Or as a fast-acting remedy, in my experience, one tablespoon will often eliminate the beginnings of strep throat. You can use remaining solid ingredients in your cooking, or you can blend the mixture up and continue to take by the teaspoon. This tonic is fine if left unrefrigerated, and will last for months, though the quantities listed above will last you two to three weeks if used at a rate of one teaspoon per day. I prefer to refrigerate it after a day or two of making it. For the first few days of use, I recommend giving the mason jar a good shake before use. 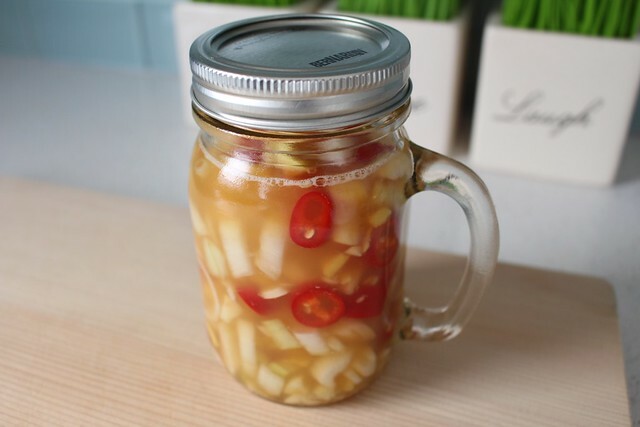 Please be aware that this strep throat, cold, and flu tonic has quite a bit of heat, so it's wise to err on the side of caution and use smaller amounts for young children and those who are highly sensitive to spicy foods. How long can the tonic be kept? 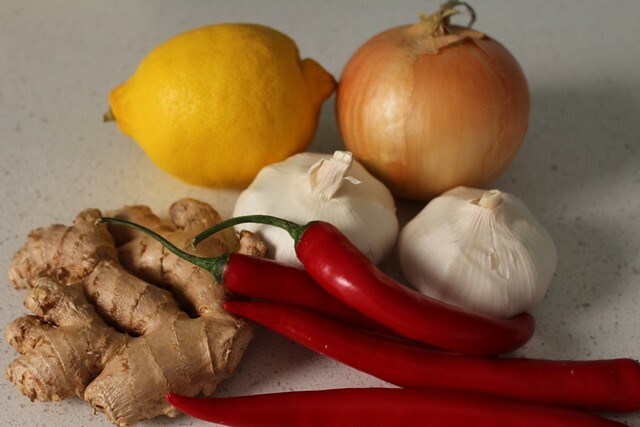 I really like the sound of the natural cold and flu tonic you posted, but am wondering how long it can be left out before it should be blended up or used in cooking? The vinegar is a natural preservative so i would think it would last a long time. I don't have room in my tiny fridge for this so will leave it out. I love this tonic! Thank you! I made it 2 weeks ago and almost finished the liquid: my question is can I still use the 2 week old food solids? I’d love to either vitamix it to a liquid or just add more flu tonic ingredients and keep the tonic going? Or do you suggest throwing away the solids and starting again? ingredients, as nutrient value in the remaining foods in that tonic will have been diminished. can't wait to make this up. Wish I'd known about it last month when we all got that horrible throat virus that was going around. Well, I'll be prepared now. thank you Dr. Kim for all of these wonderful ideas that you give us. I had been making a tea with grated ginger and garlic for strep throat and colds/flu, but I think your remedy really is the best. It warms your throat all the way down to your stomach and this sensation persists for hours. I gave this to my 11 year old who is prone to strep throat and his symptoms disappeared in a day! There will really be no days off school now. Maybe it would work even better if you took it <em>before</em> spending time around others. Given the ingredients, no one will want to come close enough to infect you. I followed this recipe to a T and included the horseradish because my husband had come down with strep throat along with walking pneumonia. The first thing he said when he tried it was that it was delicious, and promptly took two more tablespoons. The next day, he said his throat was 50% less sore, and the day after that, he said it was no longer hurting him. This was before he started any antibiotics. I started taking it along with him, and other than a low grade fever, I never got sick. I have to agree that it is surprisingly tasty! One thing to mention is that this elixir gets progressively hotter each day, so by the 7th day or so, it was too spicy for me to take. My husband on the other hand finished the whole jar, and mixed the veggies in with his meals until they were gone too. Altogether, I give this elixir an A+ in both taste and efficacy. Bad cough, so I thought of this from last year. I didn't get sick all fall and winter. At 4:00 AM I only had dried peppers, used them. But I have Trappey's Red Devil Cayenne Pepper Sauce, a great product, so I added a few tbs of that! How do you give this to a five year old boy who doesn't like hot spicy foods? I just want to vouch for the effectiveness of this tonic. I make a similar one but I simply juice those ingredients (along with fresh horseradish). I take a couple of teaspoons or gargle with it whenever I feel something coming on or have been exposed to sick people and it prevents me from getting sick every time. I haven't had so much as a cold since I started using this a year ago. It also wipes out yeast overgrowth. While it can last for months because of the vinegar, I find that the potency starts to fade after a couple of weeks. I keep mine in the fridge. Can I use dried red chiles as I cannot find red chiles in our stores right now? I cannot find red chili peppers ANYWHERE!!! I can only find dried chili peppers....do you think that would work? I really want to try this as my children are prone to strep throat. Like others that have commented here I too am having trouble finding red chili peppers. Would substituting another pepper like a habanero or jalapeno work or would that be too hot? Please Dr Kim let us know!!! Would also like to let you know that I love your articles. Your concern and love for others shows through in your writing and I consider myself so lucky to have found your website. May God bless you and your family always! Can I just throw all the ingredients in my Vitamin and puree it together? 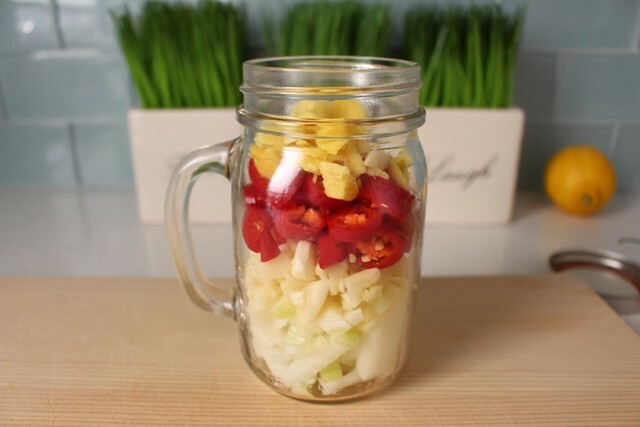 You can throw all of the ingredients together to make a puree! Flu Tonic - I'm trying it! I have made four batches of this so far and you can rest assured I will not be without it again! I truly believe this one addition has helped to keep me healthier this season. LOVE IT! I have green chili peppers already. Can I use these instead of red, or should I buy red? Thanks! As long as the green chili peppers has a little spice. The antiseptic effect comes from the heat in chili peppers. So any kind of spicy chili peppers will work in the tonic. We have been taking the tonic all winter. Not only have I not been sick, while my co-workers around me have been ill, but I also found it to be a great digestive aid when I take a tbsp after dinner. When I don't feel quite right, I increase the amount of tonic for a few days. It is pretty intense, but I feel great. My body doesn't not tolerate any foods in the night shades family, so any type of pepper is out for me. Would horseradish work? Indeed, horseradish would work very well as a substitute or an addition! I have been making a similar version to this for many years now, and I take a heaping spoonful every morning when I get up. I don't need to coffee to wake me up with this! I also add fresh horseradish and fresh turmeric for inflammation and a beautiful color, as well as some local honey to cut the heat. I put mine in the food processor and chop it in small pieces and eat the veggies and all. I use it as my daily immune booster. It works wonders and keeps my immune system constantly strong. I've found this tonic to relieve a number of problems, especially allergy symptoms. It also relieves nausea. It relieves sinus headaches. It also drains sinus congestion and then works like an expectorant. It stimulates appetite. It's delicious on scrambled eggs. 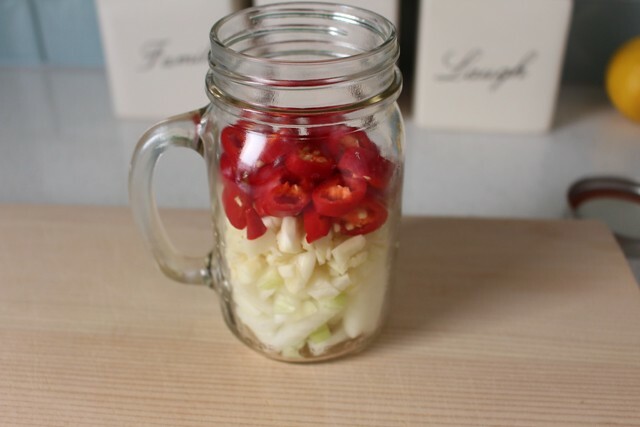 I like spicy food, so I will be experimenting with the solids from this tonic in recipes. Do you know if this tonic will stop an allergy cough? allergy or intolerance to something in the diet or environment, please look to identify and remove the stimulus. taking periodically in almost all circumstances. Substitute red bell pepper for spicy red pepper? Hi- I'd like to make this palatable for my young son who doesn't tolerate spicy things too well. Is it still effective with a red bell pepper? is there something about capsaicin that is antimicrobial? Yes, you can make this without spicy red pepper, which does have anti-microbial properties. But the other ingredients are powerful enough to accomplish the intended effects of this tonic. Thanks for everything, Dr. Ben, your products & your sharing of information both professional and personal. I especially appreciate your generosity in processing the challenges you've encountered in life out loud. All the best to you & yours! Do you think the effects of the tonic are negated if tonic is chased with water? Should stomach be empty? In my experience, this tonic is effective even when chased with water. It doesn't matter whether you take it on an empty stomach or with food. I made the tonic. After tasting it, I loved it- it's really really good. I was shocked at how awesome the flavor is. I give it two thumbs up. Sounds like it would work. 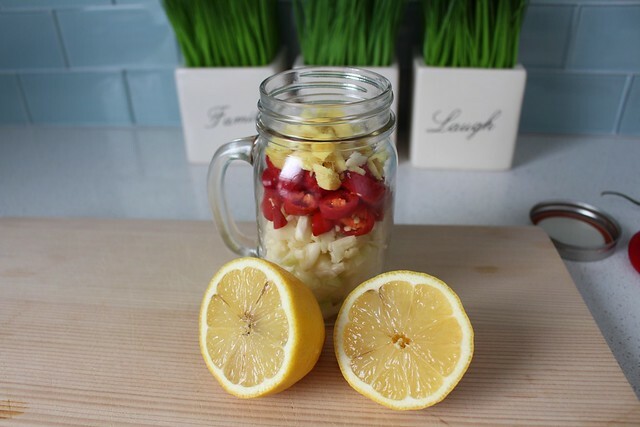 Lemon, a dose of vitamin C and a detoxifier, garlic and ginger as antibiotics. What would you use it in when cooking? Nice winter soup? Starting to have a sore throat on Thursday has caused me much worry as I have to take three flights to return home from Scotland to Australia on Wednesday. At night I remembered Dr Kim's recipe, so immediately got the ingredients on Friday, made the tonic and drank one tablespoonful two hours later as I had no time to wait two days. After that I took one tablespoonful every three hours. The sore throat symptoms totally disappeared today (Sunday), but I started a dry cough from Saturday. So I cut up a large onion, put it in a bake dish, steamed it for 30 minutes, drank the tiny amount of juice as well as ate the onion. The throat immediately felt soothed – the urge of cough has disappeared. Occasional coughs were still there today (Sunday), so I steamed an onion again tonight. I will continue to take the tonic and onion juice until Tuesday, and hope the symptoms would not recur during the two days I would be in the plane and on transit. Thank you to Dr Kim for sharing the sore throat tonic with readers. It has certainly saved my sore throat from developing into a loss of voice and a bad cold, which I am prone to, while on my way home next week. I made this, and it is so gooood! We can't get enough of it. It also has beautiful orange color. I threw in some lemon rind too and put the whole thing in the blender after the couple of days on the counter. 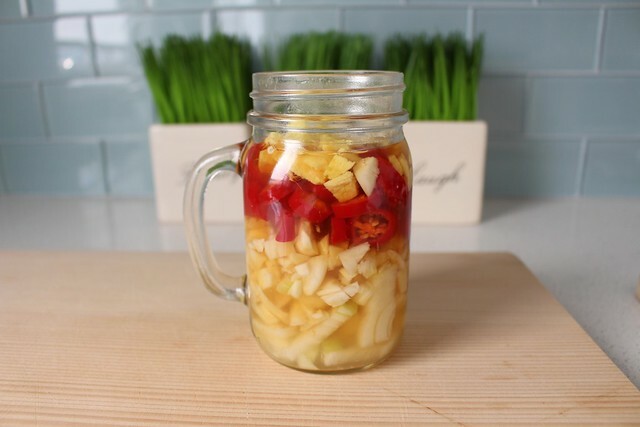 Great for digestion and awesome taste. Thank you so much, Dr. Kim. Really appreciate all of the great information we receive from your newsletters. I made a variation with fresh ginger, fresh turmeric, lots of fresh oregano and mint, garlic, apple cider vinegar, extra virgin olive oil, lemon and green tea. I did not have fresh peppers so I added black pepper, red pepper flakes, and cayenne pepper. The next day, my hubby put it in the Vitamix and said he liked it better. We followed it with deep breaths of essential oils: peppermint, tea tree, etc. and it got rid of the congestion and flu symptoms within 24 hours.